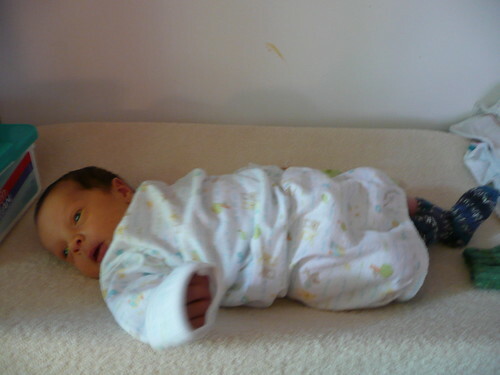 I am not sure if blogged about these way back in Em’s newborn days. Have you seen these? 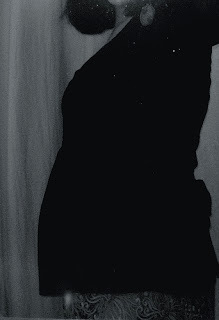 From the looks of the scrawny legs, Em was still very much a newborn here, maybe a few weeks old? Anyway, Kelli gifted me these three pairs of socks before he was born. 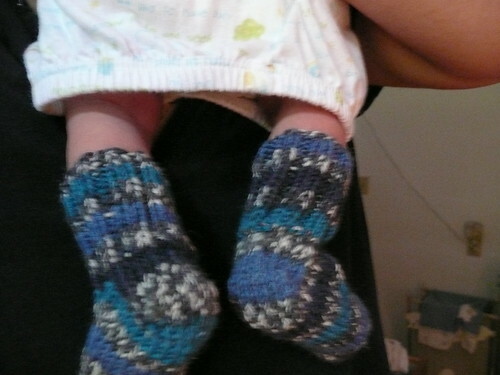 Each pair was a different size so that he could be in hand knit socks for more than just a week (as baby feet grow quickly). We retired the last pair when he was a few months old, and I thought they were each packed away. Today, one of the mamas on one of my parenting boards mentioned that she knit a sock for her husband’s inhaler, so he wouldn’t keep losing it’s cap. I thought this was so clever! Em now has two inhalers, one of which needs to travel with us in the diaper bag. I have already lost it’s cap, as the inhaler plugs into an infant chamber and stays that way most of the time. As easy as that is around the house, it doesn’t work as well in the diaper bag. 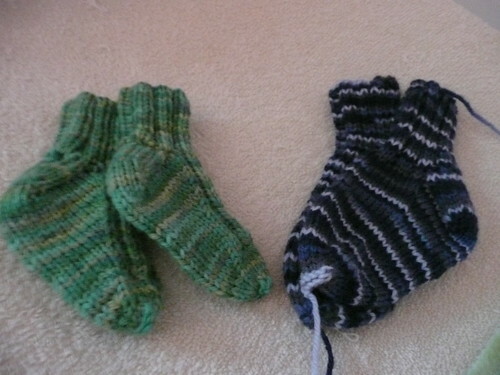 Enter a pair of outgrown socks and I have a pair of inhaler cozies! I think maybe 48 stitches and a 2×2 rib in a matching self-patterning yarn and I have a fully cozied breathing system. My plan to cover the world in handknits continues apace. Details and better pics in this post. Thanks, Kelli! *Em is better, thanks for the good thoughts! Thank you all for your happy thoughts that I’m back. I knew it had been a while, but I had no idea (until I started getting subtle emails with a day count) how long it had been. 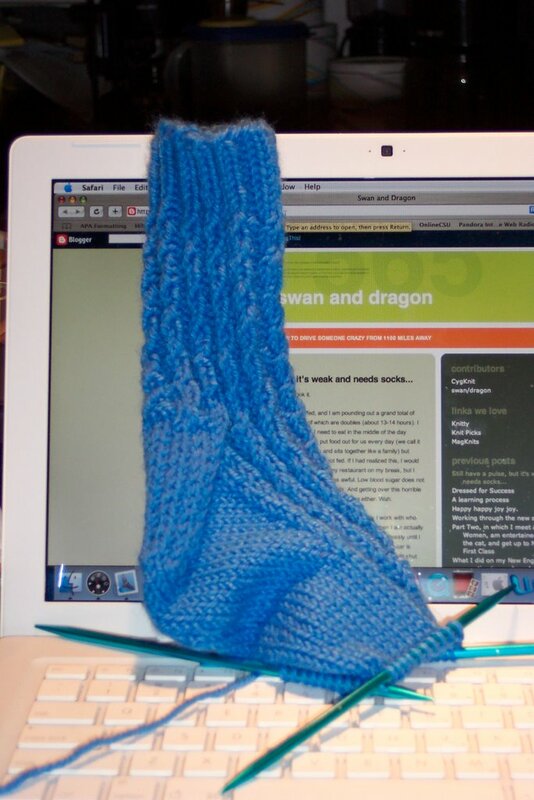 When it comes to blogging and knitting, I’ve fallen down a bit over the last seven months. This morning, though, I felt a twitch. Not a baby twitching in my belly, not a twitch from wondering just how sick my husband really is (how come so many men seem to be just dying when they simply have a cold? ), but a twitch that I felt all the way down to the tips of my fingers. I think my knitting mojo is coming back. Shhhh, don’t say anything, yet. I say, don’t get your picture taken outside wearing a low-cut top when it’s snowing. That I’m (mostly) back in action. Whoo hooo. My Mac is back from the Dr., Mr. C’s hard drive is installed and operating, our cell phones actually work (there was a recall on the chargers because they weren’t charging. I’ve been telling them this for months, but to no avail) and our camera? Well, at least it runs on batteries. So, all in all, I’m back in blogging action–at least as long as the AA’s hold up. To that end, I have pictures! I was home alone the day I realized I had batteries, so took these belly shots myself. Sadly, the lighting in the bathroom is wretched and I was forced to try out snazzy effects to make the colors less garish. I have finally determined that part of the reason I’m not knitting so much right now relates to the projects I’m working on. The socks for my mom (seen here when I thought I could finish them for Socktoberfest. Ha!) 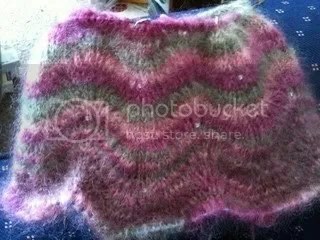 aren’t fun to knit as the yarn (Sockotta) is rough in my hands and I think the color is a bit…garish. My Mom picked it out, though, so I don’t have much choice. I do need to get them to her by my sister’s wedding on Jan 27, which means I need to get working. 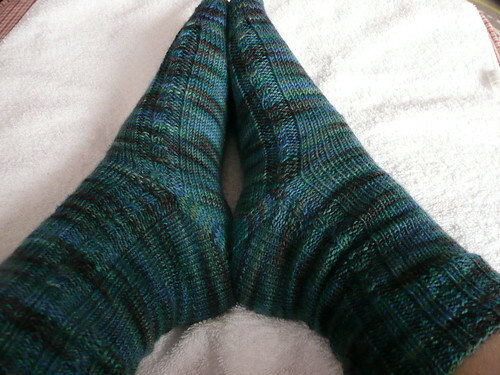 It would be nice if I finished the second bed sock for my grandmother by then, too. Although she won’t be at the wedding, my dad will be able to deliver them for me if I can get them done. I think I just need to just put on my big girl pants and get over second sock syndrome. 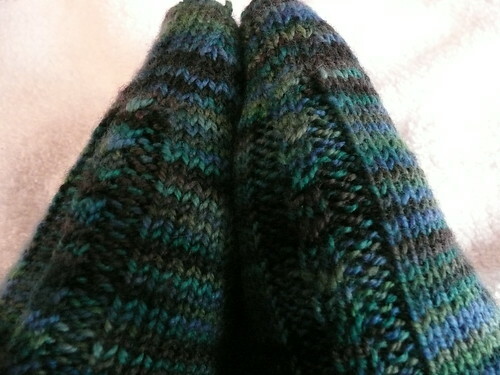 Of course, instead of working on either of these, I’ve cast on a new project to remove me from sock funk. I think I’ll save it for another post, though, as I think it will deserve it’s own. In other news, I got a package!! This is from the Lovely and Talented NeedleTart. 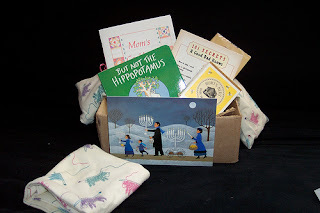 What you see is a Burt’s Bees Baby kit, a wonderful board book, a book titled “101 Secrets A Good Dad Knows,” a book of her own recipes (wow! ), a card/social game about food, and the best (hiding behind/supporting everything): a wonderfully scented “rice thingie” (her term) that when microwaved for a short time gives off warmth and lavendar-y scented comfort. She even included a spare cover for it! 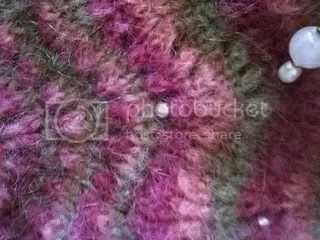 If you can click for big, you’ll see the knit sheepy pattern, too. Ms. NeedleTart must have read my mind, because I’ve been having trouble the past few weeks with sore muscles at night. Thank you from both me and Mr. CygKnit!